The Autumn/Winter 12 season so far is one of alien abrasion, the twisted, dark romance and the conceptually pitch-black. Something pre-empted by last month's Milan and Paris menswear collections. Yet Moschino are the Italian house known for their upbeat wit and provocation – founder Franco Moschino's legacy an inspiration for many a stylist and designer today. With that, Autumn/Winter 12 carries on a willful antithesis of sorts – by putting out a 60s via 80s Buffalo-hued collection with cowboy hats and epic gold buttons and hardware. 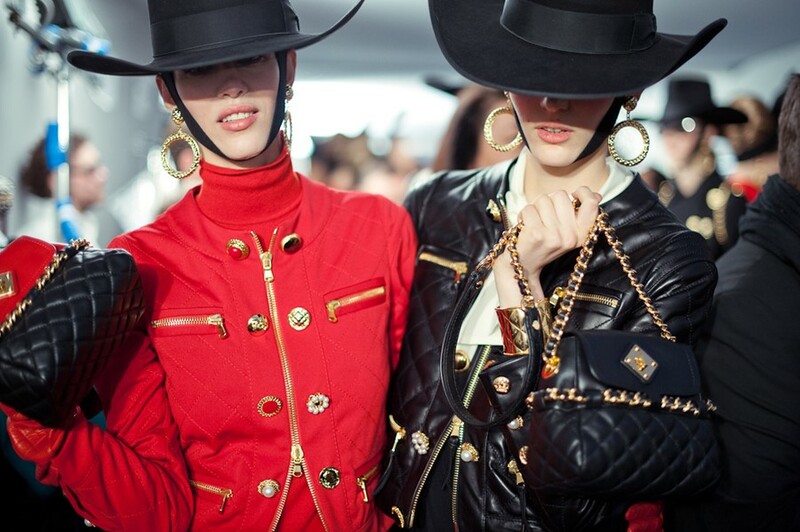 The iconic gilded Moschino belt (total caps-lock font, of course) comes back, as does quilted black leather, biker and pure rude-girl hoop earrings. Designer Rossella Jardini gamboling out of the shadows into a brilliant Buffalo Stance.